Guest post: Four-way diagonal comparison! I’m happy to host another guest post (here’s his last one) by frequent commenter and indefatigable scope hacker David DeLano. In this one David compares four 90-degree diagonals: a high-end prism and mirror, and a low-end prism and mirror. Here are pictures of the setup I used to test the diagonals. 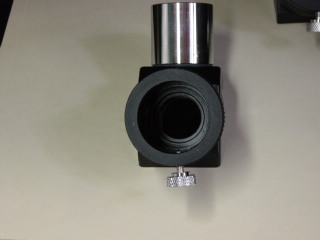 But first, here’s the dovetail on spare ring that I made for my RDF. Here is a picture of the target I shot. It’s the AC unit in the middle of the picture. 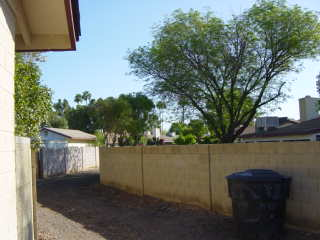 This picture is taken at the same zoom level as I used for the pictures taken through the scope. 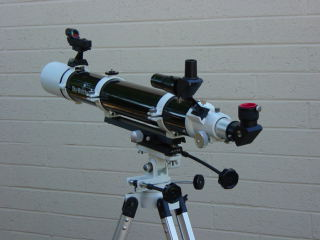 Here is the scope setup. 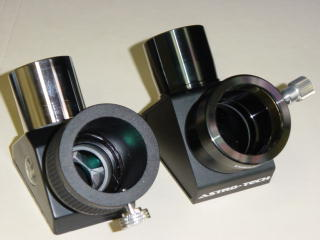 Here are the StellarVue prism diagonal on the left and the Astro-Tech mirror diagonal on the right. 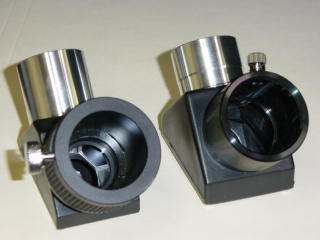 Here are the generic diagonals, prism on the left (with SV helical focuser) and mirror on the right. Here is a shot of the SV diag to show that it’s stopped down. The generic has similar baffling. 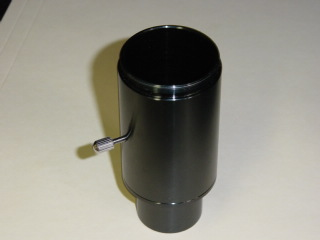 Here are the parts to the camera setup, the part that fits onto the camera mount hole to give a T-thread, the barrel that holds the EP and provides a T-thread, and both together. I used my 80AR on my AZ mount for this test. I had to extend the legs all the way to get a decent target in sight, and then had to pull out my step stool to be able to see into the camera. I used the bracket I have that puts a T-thread on my Sony P71. 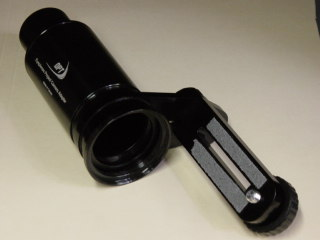 I put a SkyWatcher 10mm Super Plossl into the barrel I have, and attached it to the T-thread. I’m just not steady enough to shoot freehand like Matt does. I picked an AC unit about a block away, and was shooting at 91x. I could see heat waves, so took a couple pictures with each diagonal. I had the camera set to macro, so the telescope was doing all the focusing. I still found it very difficult to get a decent focus on my LCD screen, and it shows in the pictures. I shot the pictures to get email versions, but have the full versions for closer examination. I tried to use the same zoom for each picture, though one set is one setting wider. I used the timer on my camera so that I wasn’t touching anything when the picture was taken. The prisms are on top, the mirrors on the bottom, the generic versions on the right, and a diagonal-less shot at the end. It was a lot more difficult to get the straight shot, believe it or not, and I didn’t realize that it had drooped on me as much as it did. The collage is from the full sized pictures, reduced by 50%. I can zoom in and inspect specific data on the originals, but it really only tells me that there was a light breeze blowing. I took at least two pictures from each setup and took the best picture. I still have the same conclusions. The generic prism is the worst, but probably not as bad as the one Matt has. Definitely good enough for a finder or lower power viewing. The A-T is slightly brighter, but note that it’s a little less bright than straight through. The generic mirror holds its own, and I don’t think anyone would be disappointed using it. That is the main message here for the posters that didn’t want to buy the A-T but wondered if a generic mirror was good enough – it is. I think this convinces me that I’m not losing much with my SV prism, but it also shows me that I should give the A-T a decent shot in the 80AR. Zooming in on the pictures, I can almost read some of the tags in the A-T shot (though the text is backwards), but I can also see purple edges with the A-T that aren’t there with the SV. 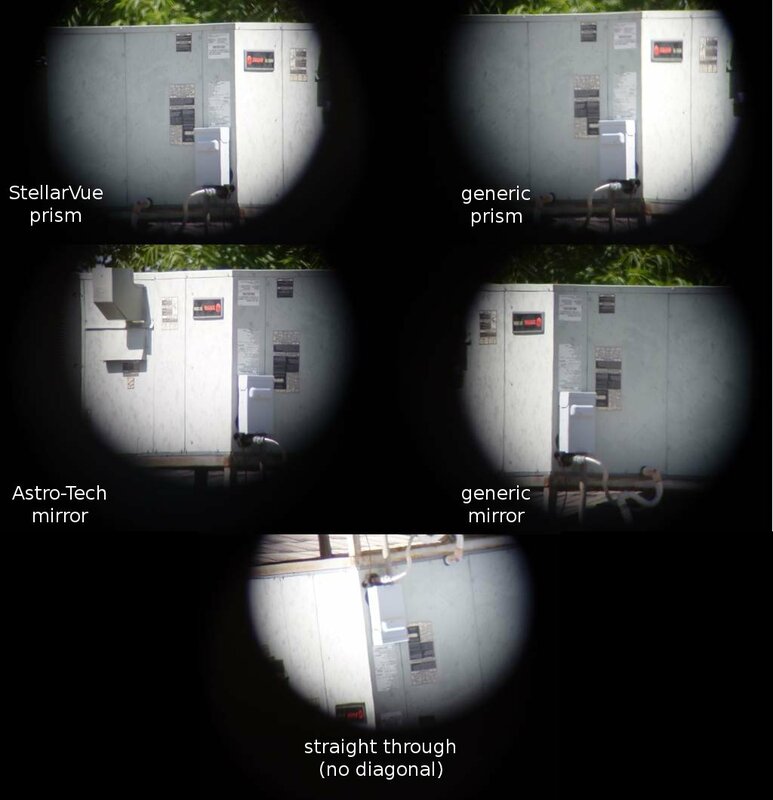 People disagree with Vic [Maris, of StellarVue] that their prism takes out some CA, but these pictures would say that he’s right (and I’ve not heard an explanation as to why it reduces CA). An interesting note…..there is a seam on the electrical box going down the middle of the edge. On all these shots, I used that to focus on, to be as consistent as possible. It was definitely there in the camera LCD. You can’t see it very much at all in any of the pictures. Well, this isn’t quite what I expected. I’m guessing my ability to focus is a variable that needs to be removed. But, I’d be happy with any of these, with the generic prism coming in last. 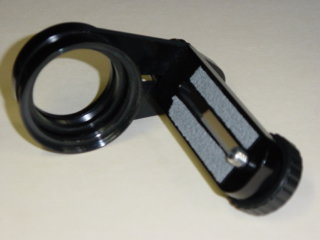 If your prism is of worse quality, I can see you not wanting to use it. But the SV appears to hold its own, and knocks down some of the CA (which it is rumored to do – I won’t say advertised). The A-T is definitely a brighter view, and I look forward to getting it out under the stars to see how it does. For those worried about a generic mirror, it holds its own. My guess is that I spent $15-20 for this one and it’s the one I started with several years ago. BTW, I have a third prism that I didn’t test. I have an Orion brand in the GS. It too is stopped down more than a mirror. I’m guessing that stopping down an underperforming prism would help with the reflections. 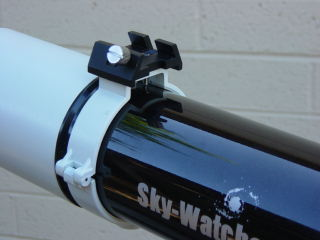 You are currently browsing the 10 Minute Astronomy blog archives for the day Saturday, June 2nd, 2012.